Removal: Locate nozzle over component, everything else is automatic (nozzle height adjustment, heating, vacuum sensing, removal, and drop off). 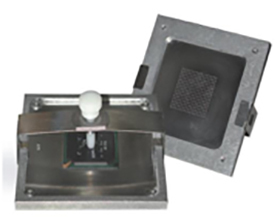 Site Cleaning: The vacuum sensor automatically adjusts to insure that the tip does not contact the board pads. Replacement: Operator aligns component, then pick-up, placement, and all heating and cooling processes are automatic. • Calibration controls for temperature and flow rate at multiple set points. • Upper Heater: 1000 watt high efficiency (patented) with PID control and integrated cool air bypass reduces package temperature and controls joint time over reflow. Mass flow controller regulates precise heat flow (accuracy and linearity +/-1%, repeatability , .1% full scales). • Preheater: Radiant IR panel bottom heater, high thermal uniformity, based on proprietary design. 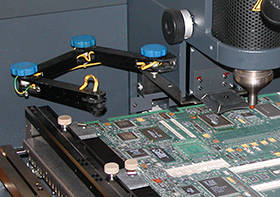 • Integrated automatic pcb and machine cooldown system; insures operator safety handling pcb, brings system back to initial conditions for process repeatability and aids in controlling joint time over reflow. 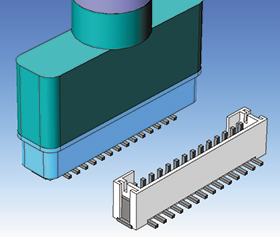 • Integrated pop-up pcb supports, pcb expansion control, and flexible position pcb edge supports. • Force placement control: load cell indicates actual (real-time) and target setting (50-3000 grams). 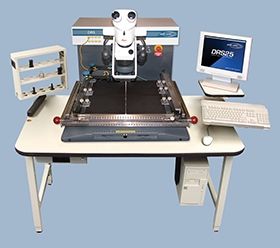 • Motorized z and vision axis: component placement, pickup, flux/solder dipping and drop off. 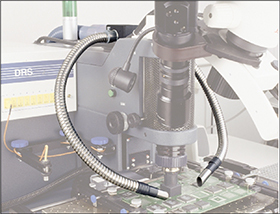 • Vacuum sensor control: activates automatic component removal (eliminating solder squeeze out). Site cleaning non-contact tip height is accurately monitored and maintained. • Temperature-based preheat: regardless of machine or board conditions, the non-contact IR sensor triggers when preheat setting is reached and monitors throughout the process. 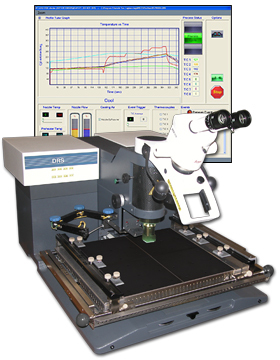 • Vacuum sensor automatically and continually adjusts tip height and compensates for variable residue solder volume. 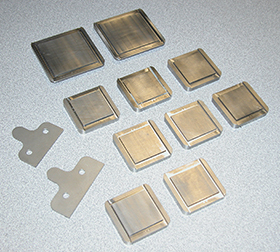 • Closed-loop hot gas heats pads after component is removed. • Non-abrasive, composite vacuum tip safely removes residual solder. 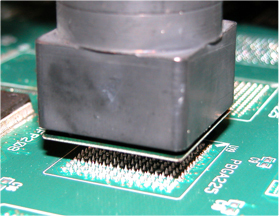 Eliminates damage to pads and solder mask caused by contact-based methods. 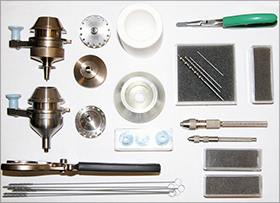 • Micro components utilize micro contact tips without affecting adjacent dense area. Precision Rework in Four Simple Steps! • Special nozzles for special attention to thermal control, joint temperature uniformity, limitation of heat to device or sensitive areas and production concerns. 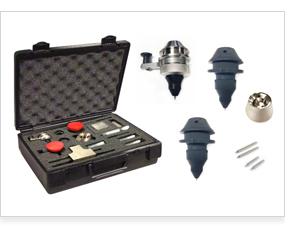 Air-Vac has designed and manufactured thousands of standard and custom nozzles for BGA's, 01005's, connectors, QFN's, sockets, and more. • Simply set the target temperature and go. 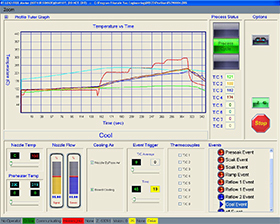 • Preheat, soak, ramp, reflow, and cool down events are automatically run. • After the profile is complete, then entire rework process (removal, site cleaning, replacement) is built automatically and ready to run. 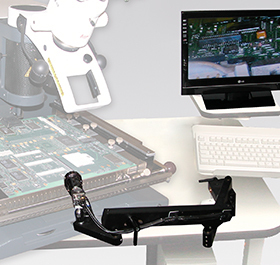 • Our ongoing technical service and process support is a major value-added part of our total product offering. 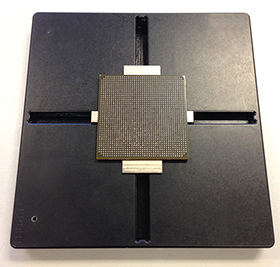 • Board Carrier: 24" x 24"
• Provides process repeatability by insuring that the board is at the exact same target temperature each time before localized reflow begins. 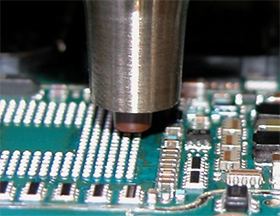 • Operator is instructed to position the sensor at the beginning of the process. • The non-contact temperature sensor monitors topside board temperature and automatically triggers the localized reflow process once the target is reached. • Precision Rework in Four Simple Steps! • Mechanically self-centers any device for accurate pick up. • Used in conjunction with Vision System Component Shuttle. or reflow at board level. • Camera adjustments include focus, zoom, and apeture. • Includes camera/zoom lens, fiber optic lighting, 20" monitor, and boom stand. 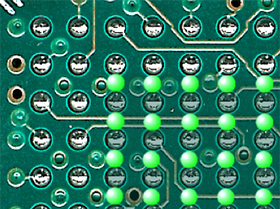 solder spheres on the device. • Used in conjunction with the Component Shuttle. in conjunction with the Component Shuttle to pick the pasted device. • Provides a self contained work cell environment for the machine and operator. • 60"W x 36"D, sturdy construction with anti-static laminate surface.